Annual Open Day. Open to all visitors. All Souls Service. Open to all visitors. In 2000 the people of Wells were alerted that it was proposed to sell the land containing the Chapel and graves of 2,900 persons who had been patients or staff of the Mendip Hospital. The last burial took place in 1963. A meeting was held in the Town Hall and the outcome of this meeting was the formation of The Friends of Mendip Hospital Cemetery. The Friends have been in operation since this date. After a great deal of work the site is now a pleasure to visit. The aim is to keep the site in pristine condition and to encourage people to visit on open weekends. One of the gratifying outcomes of work undertaken by the committee is tracing peoples' relatives who are at rest in the Cemetery. This task is ongoing and helped by the formation of a register of all the people buried there. This was compiled by one of the Friends and represents a lot of hard work over the last couple of years. “To preserve and protect the former Mendip Hospital Cemetery site and enhance the site as a public amenity and to maintain, repair, restore, preserve, improve, beautify and reconstruct the fabric of the Chapel at the former Mendip Hospital Cemetery site as a place of historical or architectural merit and to advance public education in the history of the Mendip Hospital, the Chapel and the Cemetery”. New members and volunteers are warmly welcome. The annual membership fee is a minimum of £5. Donations and legacies to enable the continuing stewardship of our 999 year lease with Mendip District Council are also warmly welcome. Honey harvested from the cemetery beehives can be purchased at the Chapel whenever the Cemetery is open. Small jars (1 1/2 oz.) and large jars (12 oz.) are for sale when honey is available. All proceeds go to the Friends of Mendip Hospital Cemetery charity. 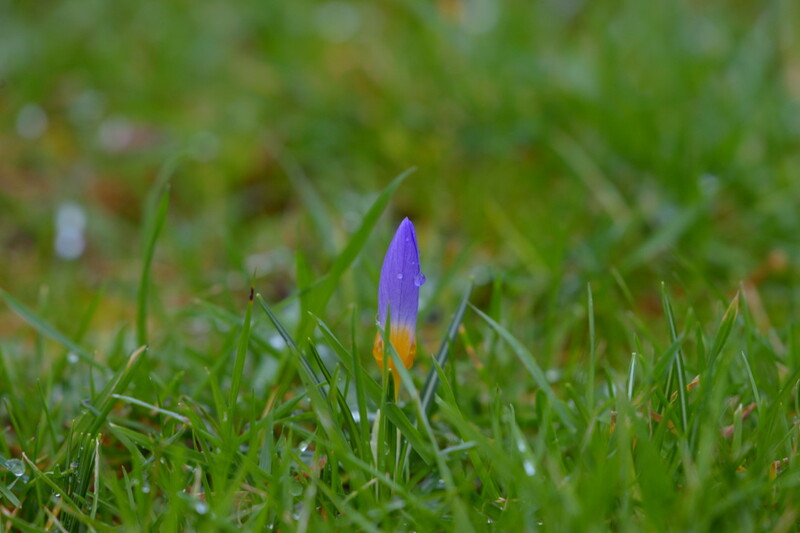 Mendip Hospital Cemetery - First Crocus of the Year - 12th January 2019. 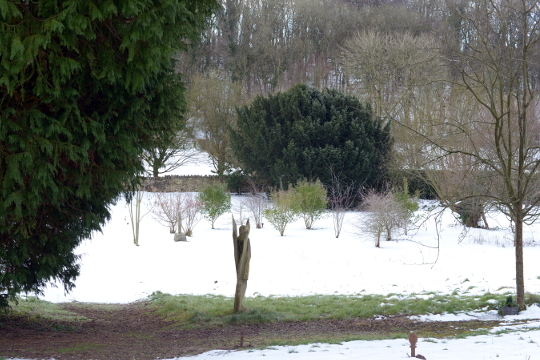 Mendip Hospital Cemetery - First Snow of the Year - 3rd February 2019. 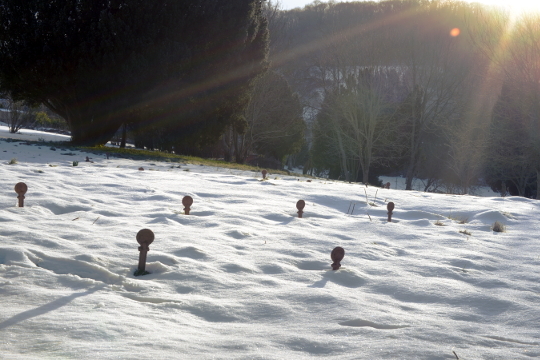 Mendip Hospital Cemetery - First Snow of the Year - Sculpture - 3rd February 2019.